Football teams around the world are battling it out to win the 2014 World Cup and we are now down to the semi-finals. 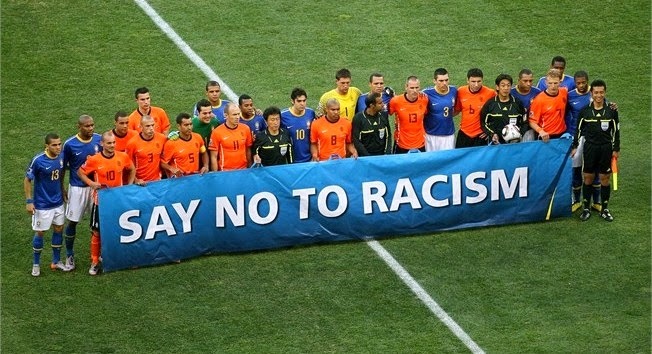 Before a match you might have seen the teams gather around and hold a sign that said “Fifa says no to racism”. Racism and other forms of ‘ism’ destroy society from within by turning the focus of society away from the core issues which actually affect society. We talk about the corruption in Naga society, the sham liquor prohibition, the never ending NPG talks and unabated taxation. These types of issues will probably always remain, until and unless we are truly able to hear the voice of the people. The voice of the common people will never be heard if civil society and the government are in bed with each other in an, “I scratch your back and you scratch mine” arrangement. The public need to be educated and aware enough to see through doublespeak and fight for the right causes. We need a dynamic society where voices can be heard and not one where civil society parrots the voice of the elite or one where politicians have their followers unquestionably following them like lemmings. What we need to realize is that our future isn’t going to be bright and prosperous by solving only one big problem. When one of the problems is solved, new ones will eventually crop up. What we need is an environment where the many problems society keeps throwing at it, are solvable on a regular basis through the active participation of all stakeholders with their focus on the right goal. This World Cup, I have been feeling like Paul the Octopus, picking match winners left, right and center, that is until I fell flat on my face when USA lost to Belgium in the second round. The US football team has always been weak and the American population least interested in football compared to the main football playing nations like Brazil, Germany etc. I would have been overjoyed to see the US football team progress further, because not only were they the underdogs but are also living proof of what happens when you combine youth with the right exposure, facilities, laws and a conducive environment. The current U.S. football roster is filled with players who got hooked on football during the 1994 world cup when the USA hosted the event. Eight years later, the U.S. would reach the quarterfinals of the men’s World Cup. And 20 years later, the 2014 U.S. team is filled with players who trace their interest in soccer or their first memory of the game to that 1994 World Cup. This world cup also brought increased viewership. According to the New York Times, 2014 World Cup “Television ratings in the United States blasted through ceilings, surpassing those of the N.B.A. finals or the World Series”. We could be seeing USA winning the World Cup in the next 10 to 20 years if they keep going at this pace. So, since USA is now likely to win the World Cup soon after having hosted the World Cup, that means if India hosts the World Cup, India will eventually win the World Cup, right?…Nah. I bet some of you reading this are laughing hysterically at the thought of India ever winning a football World Cup. Realistically speaking, it seems impossible to think of India ever winning the football world cup. It seems even more difficult to imagine in that team will be a talented Naga football player picked from our villages or from the streets, as was the case for Brazilian greats Ronaldo, Romario and Pele. India winning the world cup with a host of players picked from the villages might seem impossible right now… but we can hope. If we are going to make the impossible, possible then we need to look at our state and our society with undiluted realism and the unpleasant facts on the ground if we are going to solve the issues which prevent us from progressing. Every country is unique with its own set of unique strengths and problems. In a diverse country like India, we can narrow that down to every state being unique with its own unique set of strengths and problems. In football or any sport, while it is the players who actually win matches, it is these other factors which are needed to create the right environment so that those players can excel. Does Nagaland provide that environment? Well, on 12th May 2014 at an interactive session with a few All India Civil Service Officers and students at Tetso College, we had the pleasure to meet Samuel Changkija, IFS. Here, he proudly declared he was a 100% indigenous product of Nagaland. What he meant was that he did his entire schooling from class A to his Masters right here in Nagaland. After his studies he appeared for the civil service exams and was inducted into the IFS in the Jammu and Kashmir cadre. The irony is that someone who studied his entire life in Nagaland is now technically going to be working his entire life outside the state. I would have to say Nagaland did help provide the grounding in this case. The educational environment is heavily dependent on private players in Nagaland for quality education and they have been significantly raising the quality bar. However, the economic and commerce scenario is in a dismal state. In such a scenario, the dream of winning a World Cup is probably the last thing on our mind. Our society has problems, many of which our leaders and we ourselves seem to prefer to ignore or turn a blind eye to. But if we are to progress then we need decisive decisions and action taken on the delicate issues affecting progress in our state on major issues like prohibition, unabated taxation, corruption or talks with the NPG groups. We need a response from apex organizations and government on major issues like prohibition, unabated taxation, corruption or talks with the NPG groups. A stand needs to be taken and silence is just not a satisfactory answer anymore. We need leadership that can use its authority beyond narrow self-seeking ends or for opportunities which will provide an advantage for their ethnic group or tribe only. In today’s globalised world, just because you grew up in a village, it does not mean that you will die in that village. At the same time, this could also mean that even if you grew up in the city it’s possible you may make a village your final home. Our youth need to look both at Nagaland and beyond. Look at India and beyond. Good governance reveals itself when they can implement policies and enforce the rule of law to create an environment so that common people and our youth feel empowered and heard. If that can happen then we might witness unprecedented economic growth for society as a whole. It would result in a growing middle class and an emerging network of civil society organizations free from the constraints under which political leaders and their followers labour. But for this to happen, we need institutions capable of resolving disputes impartially free from any form of ‘ism’ to provide a platform for a fair and unbiased ‘level-playing-field’ competition. The flip side is that this enhanced social and economic complexity will come into increasing conflict with control-oriented political and state institutions. A balance needs to be found and maintained to create an environment which will allow someone to become a world renown entrepreneur or an ordinary poor Naga child from a village to one day become the next football World Cup superstar. Ref: Armour , Nancy. U.S. soccer success traces back to 1994 World Cup. USA TODAY Sports. June 27, 2014.